Energy Petroleum Company’s Fleet Fueling service provides your company’s fleet diesel or gasoline, day or night, accurate and dependable service. Energy Petroleum offers a transportation logistics system which offers a feature-rich, real-time solution for processing orders, managing dispatch functions and digitally capturing delivery information. The unique design of the truck dispatch software, provides a high degree of core functionality. 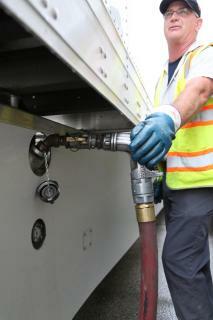 The system fully accommodates our tankwagons, transports and fleet fueling operations. The system utilizes a handheld computer, found in the cab of each truck. Hand held computers are used for deliveries made by both tankwagon and transport, as well as operations or in environments where fleet fueling is required. All approved handheld devices offer portability, signature capture and barcode scanning. Energy Petroleum trucks are equipped with thermal printers, and drivers can be outfitted with belt-mounted printers to accommodate customers’ requirements. Energy Petroleum trucks are also equipped with document scanners helping in invoice turnaround times and invoice reconciliation. 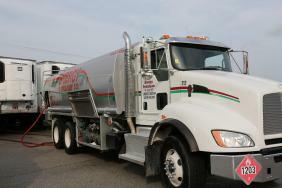 Our software enables Energy Petroleum to take complete control over our trucks, employees and inventory; the three most costly components of our business, thus increasing our productivity and providing significant cost savings to our customers and allowing them access to our fleet once unheard of in the industry. Energy Petroleum has been a forerunner in the fleet fueling market and continues to lead the way with our transportation logistics program. 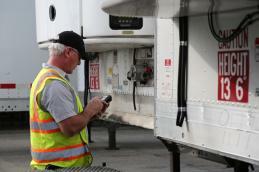 Fleet fueling applications are a perfect candidate to take advantage of the bar coding portion of our system. What does Energy Petroleum Offer? The system allows Energy Petroleum to track fueling locations easily with GPS technology, capture vehicle identification numbers, product delivered, gallons delivered, and verify the time each vehicle was fueled. Call or email now for your free business analysis and see how Energy Petroleum’s Fleet Fueling program can work for you so your assets can work for you! Please email sales@energypetro.com or call 314-383-3700 to inquire today!